Note: this should be enough mixture to fill a pyrex bowl shaped dish (2 pint size) and a 20cm sandwich round cake tin. You can modify the quantities depending on the size of cake you plan to make. I improvised with the pyrex bowl and sandwich tin but you can buy special mould’s for a dome shape. Doll cake pick which can be bought online or in specialist bakery shops (this is the body of a doll on a spike that sits on top of the cake). Note: there is lots of inspiration online for princess doll cakes and plenty of images that you can look at for decoration ideas etc. Cream together the butter, sugar and lemon zest until light and fluffy. Gradually beat in the eggs a little at a time. If the mixture shows signs of curdling, add a spoonful of the flour. Mix the flours together and carefully fold in. Add a little milk if necessary to give a soft dropping consistency. Spoon 2/3 of the mixture into the prepared pyrex dish and put a dip in the middle (the cake will rise more in the middle than around the sides so this will help to even it out. Put the remainder of the mixture into the round sandwich tin. Bake in the oven for approximately 20-25 mins – after this time the sandwich tin cake should be cooked and can be removed. After a further 45 mins test to see if the cake in the pyrex dish is done – put a skewer into the centre of the cake and when you pull it out it should be clean – if there is mixture on it then the cake needs longer (it can take another 10-20 mins and will require testing at 5 minute intervals. Once cooked, turn out the cakes on a wire rack and leave to cool. Once cooled, you may need to trim the flat sponge so that it is the same diameter as the dome shaped sponge (which will sit on top of this to make the skirt). Cut the dome sponge about half way up right across. You will now have 3 pieces of sponge. Sandwich each sponge together with a layer of butter cream and jam. You should now have a 3 layer dome shaped cake that will make the “skirt” of the princess doll. Cover the entire cake with a thin layer of buttercream. Take one block of fondant icing and 2/3 of the other block and kneed together and form a ball. Roll out the icing in a circle large enough to cover the sponge. Place the sponge on a cake board or whatever base you plan to use. 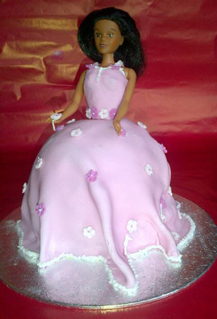 Lay the fondant icing over the sponge – if it is too wide and creases you can let it drop in folds (like a dress). Trim any excess off at the bottom. Make sure the bottom edge meets the base in order to keep the sponge airtight and fresh. With the remaining piece of fondant icing roll it out in a small rectangular strip and cut out bodice shape to fit around the body of the doll pick. This will be the bodice of the dress. If there is enough left you can make straps for the bodice (or you may want to ice these, whichever you find easier). Decorate the cake with iced flowers over the skirt or whatever decoration you want. Pipe icing around them of the skirt and around the edge of the bodice on the doll pick (you can ice straps and buttons onto the dress bodice as well if you wish). Place the doll body into the top of the cake when finished. I live in Wanstead and was told about Free Cakes for Kids by a good friend who encouraged a group of us joined up at the same time. I enjoy baking and thought it would be an enjoyable way of giving something back to the local community. I work in the city organising events and marketing trips so baking is a good outlet for my creative side! My daughter who is 12 years old helped with the cake and encouraged me to be adventurous and try the doll cake. It also gave her an opportunity to learn some cookery skills and we had great fun making this particular cake together.